Heavy Duty Swing Clear Hinges for exceptionally heavy Exterior Solid Core Doors. 4 Holes in each side. Heavy Duty Swing Clear Hinges for Exterior Solid Core doors. Medium Duty Swing Clear Hinges for Exterior or interior solid core doors. 3 holes in each side. Light Duty Swing Clear Hinges for interior hollow core doors. Note: 4-1/2" and 4" hinges will have (4) mounting holes in each side. 3-1/2" hinges will have (3) mounting holes in each side. 3-1/2" Light Duty Hinges (3) mounting holes in each side and rounded corners. Decorative long lasting finishes such as bright brass, brushed brass, brushes chrome, and primed for paint. 1. 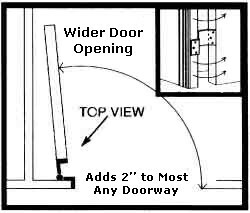 Measure the length (top to bottom) of your existing hinges. They should be either 3 1/2", 4" or 4 1/2". 3. Choose the desired finish. 4. Count how many hinges you will need (priced per each). Questions about our hinges? Visit our Frequently Asked Questions page!